This adaptation was based on Curtain: Poirot's Last Case, first published in 1975, just a few months before Christie's death, but written during the war, in the early 1940s. The novel was adapted for television by Kevin Elyot (who also scripted Five Little Pigs and Death on the Nile) and directed by Hettie Macdonald (who also directed The Mystery of the Blue Train). The press pack to this final episode reveals that Kevin Elyot was asked by the production team to adapt Curtain more than ten years ago, when he wrote the scripts for Five Little Pigs and Death on the Nile. I'm not at all surprised they asked him. His script for Five Little Pigs is possibly the best of the entire series, and Death on the Nile proved that he wasn't daunted by the task of writing an adaptation most Poirot fans have been both eagerly waiting for and dreading at the same time. 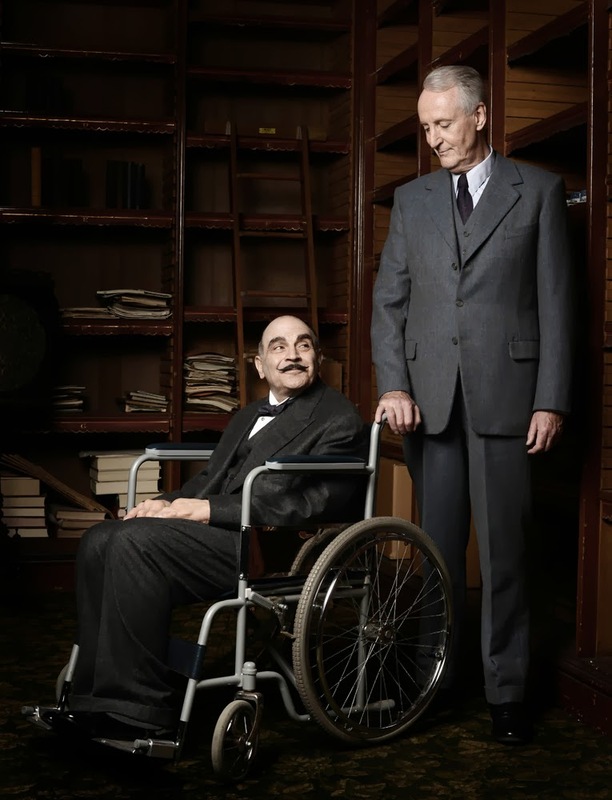 He had also demonstrated that he fully understood Poirot's character, and that he could handle the darker side of Christie without making unnecessary changes. In my opinion, he was the best man for the job. SPOILERS. IF YOU HAVE NOT SEEN THE ADAPTATION YET I WOULD ADVISE YOU TO WAIT - READ THIS POST AFTERWARDS. 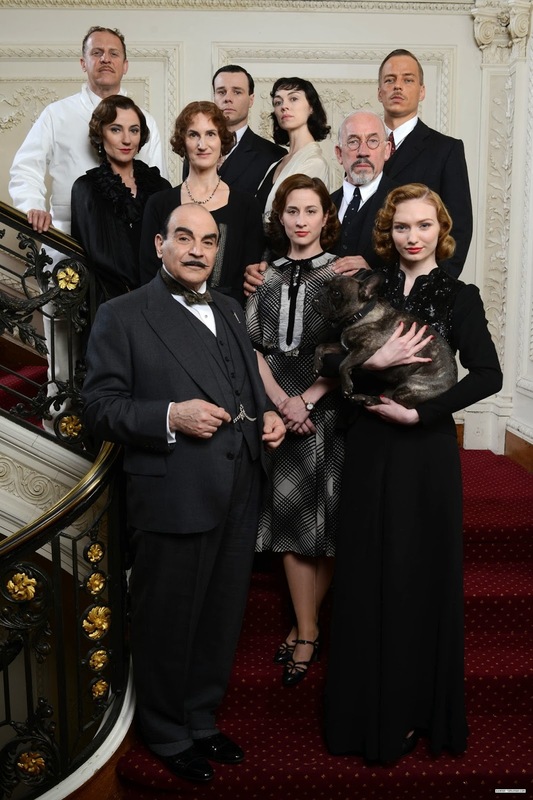 Last week, Agatha Christie's Poirot came to an end as Curtain: Poirot's Last Case was broadcast on ITV. But fear not! 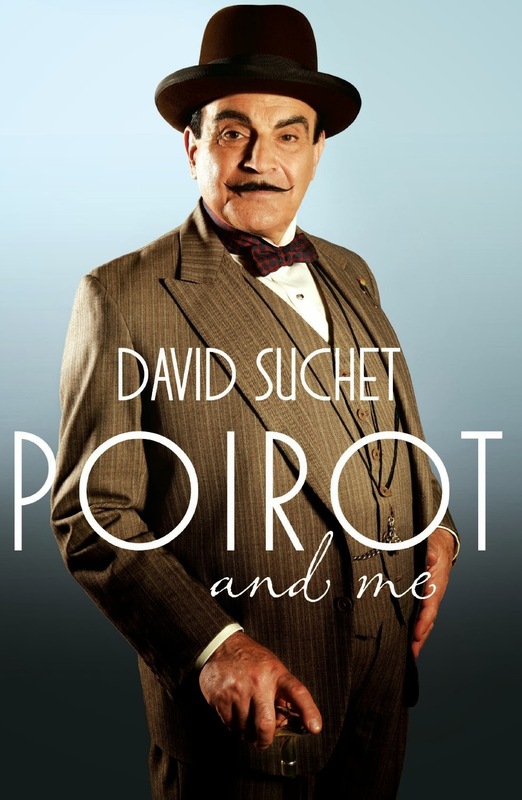 To coincide with the broadcast of the final series, Headline Publishing have released a book, written by David Suchet in collaboration with Geoffrey Wansell, called Poirot and Me. The book is an absolute must-have for any dedicated Poirot fan! When I first heard about the plans for this release back in autumn 2012, I was immediately over-excited. 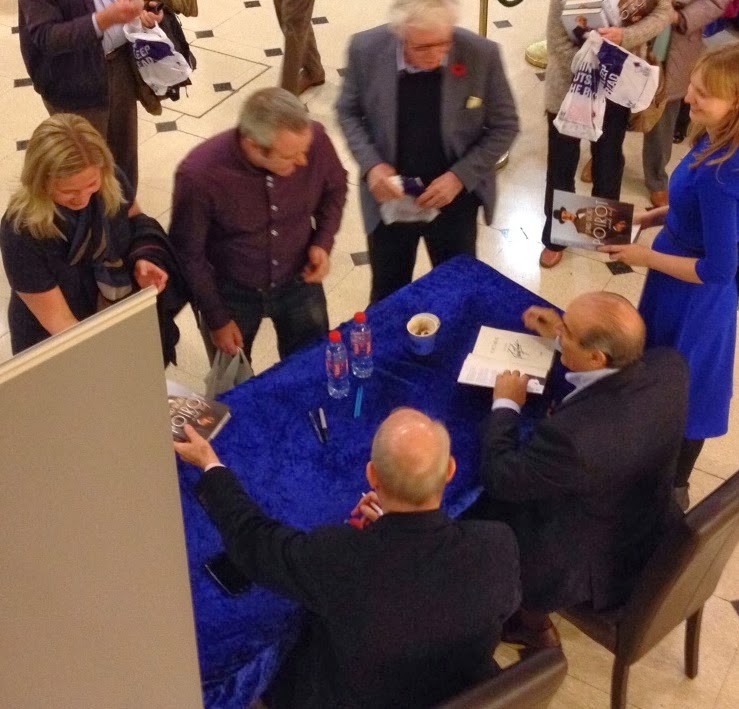 Having seen numerous interviews with Suchet in the past, as well as his documentaries, I was confident that we could expect great things from this book. In short, my expectations could not have been higher. This is the man who for twenty-five years has portrayed one of my favourite literary characters in an iconic television series. Let me start by saying that it did not disappoint. Far from it. With over 300 pages, the book includes comments on every single episode ever made, plus some biographical Agatha Christie information. For the first time, we get the full story of how Suchet became Poirot (the walk, the talk, the appearance), with first meetings, first costume fittings, first shoots and several acting epiphanies included. We are also treated to little anecdotes from his encounters with the Poirot fans, some of which are absolutely delightful to read. We even get his 'character dossier', the list of 93 Poirot characteristics that he carried with him on set (I was secretly hoping for this to be included, but I never thought we'd actually get to see it! ), and a series of photos Suchet has taken on the sets over the years. This is far more than just a Poirot 'encyclopedia', though. This is the life story of a character actor. I don't think I have ever seen a character actor who has been given the opportunity to describe the process of becoming different characters. In short, his craft. 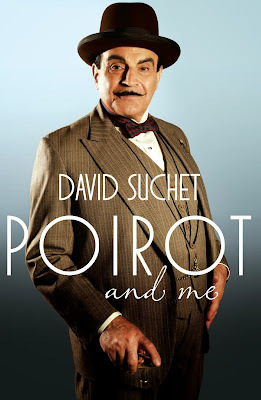 Poirot aside, we also get glimpses of all the other great characters Suchet has played, including the famous Shakespeare roles, George in Who's Afraid of Virginia Woolf, Salieri in Amadeus, Robert Maxwell in Maxwell, James Tyrone in Long Day's Journey Into Night, and many others. We get to share his anxiousness as he waits for the phone call from ITV saying that they want to do another series, his money worries, and holidays with his family. Sometimes when you read 'celebrity biographies' you can tell that it has been 'polished' by some PR department, and certain stories have been included to put the writer in a good light. This, however, is a very personal story told in what appears to be a very truthful and honest way. Geoffrey Wansell should probably be given some credit here, too, because the book is incredibly 'visual', in the sense that you really feel, as a reader, that you've actually witnessed all these things. You have been a part of Suchet's journey. That is quite unusual. Personally, there were some things I was even more delighted to read about than others. 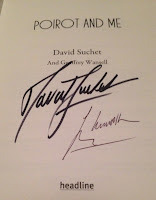 It was encouraging to read about Suchet's disputes with some of the Poirot directors, his determination to re-introduce Whitehaven Mansions after a long absence and include Poirot's manservant, his personal contributions to the set designs (he bought the clock on Poirot's mantelpiece for the production team! ), and his firm belief to stray true to the character. This is a man with a vision. In fact, that's a thought I kept coming back to while reading the book. On several occasions, Suchet has said that his aim as an actor is to serve the writer. 'Without actors, writers don't have a voice'. These glimpses behind the scenes demonstrate Suchet's determination. 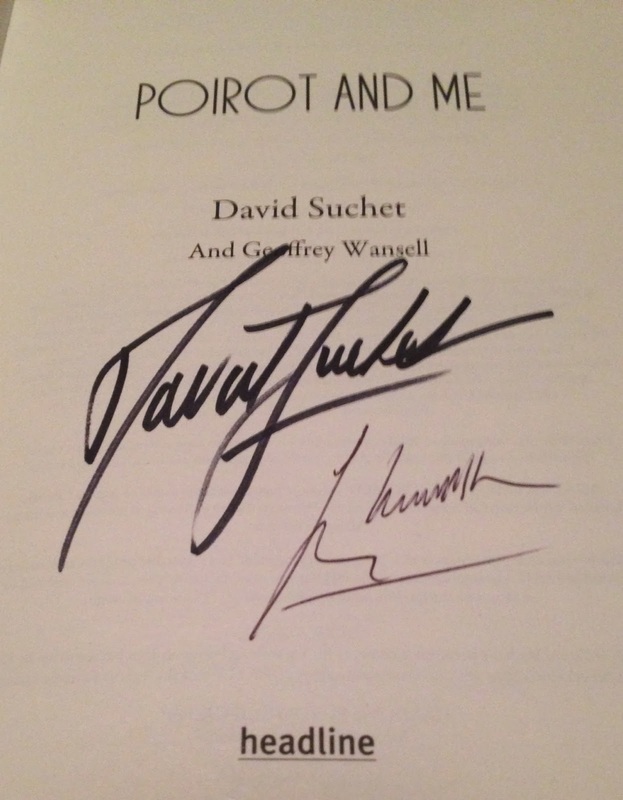 He has been committed to Agatha Christie, regardless of what some Christie 'purists' might say, while at the same time fleshing out Poirot to truly iconic dimensions (see my post on Suchet's achievement here). His reflections (in the book) on Murder on the Orient Express and the moving story from the filming of Poirot's final case, Curtain, underline this, too. 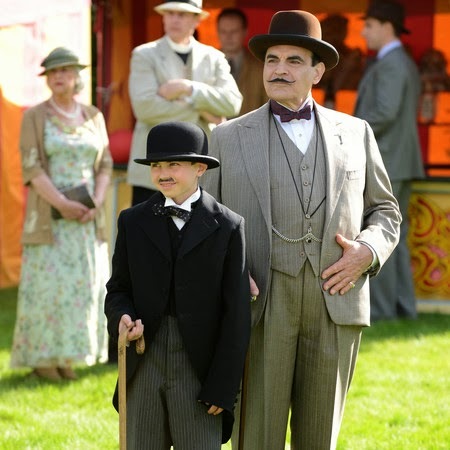 All in all, Poirot and Me is a treasure-trove of information for any fan of David Suchet, Hercule Poirot, and Agatha Christie - not to mention anyone interested in acting, television and adaptation work. Highly recommended! P.S. I've been told by Headline that an audiobook version will be released on 21 November 2013, read by David Suchet! The book lends itself easily to an audiobook, and I'm sure the story will feel even more personal when read by Suchet himself. Richard, a reader of the blog, kindly sent me these photos from one of Suchet's promotional talks. It must have been quite an evening! This episode was based on a series of interconnected short stories, assembled in The Labours of Hercules, first published in 1947. It was adapted by Guy Andrews and directed by Andy Wilson. SPOILERS to follow. This adaptation was a Herculean task (to borrow the pun). Fans - me included - have been discussing for years how the team behind Poirot would ever be able to adapt this collection. Essentially, this is a series of thematically interconnected stories. They are linked together by Poirot's decision to do only a selected number of cases before he retires, and all the cases are to resemble the labours of Hercules in some way or other. Now, in the earlier years of the series, this could almost certainly have been expanded into a series of 50 minute episodes, and a part of me is disappointed that this didn't happen. But for those of us who know a bit about the history of the television series, that would probably never have happened. As a matter of fact, it's remarkable that they even got to make all the other short stories in the early years, before the series was effectively cancelled in 1994/1995. (That is not to say that I wouldn't have loved to see these as a series of episodes!). Considering that the final series nearly didn't happen - and the fact that this collection was one of the candidates to be dropped - I think we've been lucky to see an adaptation of it at all. The scriptwriter chosen for this difficult task was Guy Andrews. Just to remind you: he also scripted The Mystery of the Blue Train, Taken at the Flood and Appointment with Death. That's one weak, one slightly unbelievable, and one terrible adaptation (in very crude terms). As you will know if you've read my episode-by-episode look at Appointment with Death, that's a very clear candidate for my least favourite episode of Poirot. It's saved by the beautiful cinematography, music, production design and acting. I was more than a little nervous when I heard that he had been commissioned for The Labours of Hercules. At the same time, this adaptation called for changes. Radical changes. And I was perfectly prepared to accept loads of them if he - against all odds - managed to make it work. 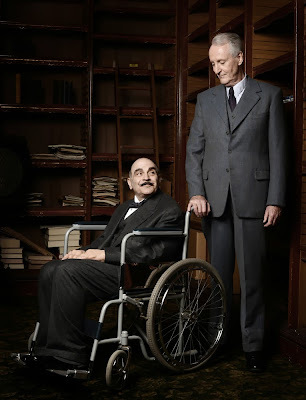 Since the final four episodes have just started airing in the UK, I've decided to do a post on all the information you'll need on Series Thirteen; Elephants Can Remember, The Big Four, Dead Man's Folly, The Labours of Hercules and Curtain: Poirot's Last Case. The post will be updated and re-posted constantly in the coming weeks, with links to press releases, press packs, trailers, clips, important interviews, reviews and photos that might interest fans. As always, comments are more than welcome, so feel free to ask questions, give a small review or post your thoughts in the comments section! Read my episode-by-episode look at 'Elephants Can Remember' here. Read my episode-by-episode look at 'The Big Four' here. This episode was based on the novel Dead Man's Folly, first published in 1956. It was adapted by Nick Dear (by now one of the 'regulars'), and directed by Tom Vaughan. Nick Dear's script is a very faithful retelling of the novel. Certain sections are moved around, some have a slightly different setting, and some sections are shortened down (especially the interviews), but most of the action is kept intact. Let's look at some of the changes. Obviously, the time setting has bee changed from post-war 1950s to pre-war 1930s. This doesn't manifest itself in any particular changes, apart from the deaths of Mrs Folliat's sons. Moreover, Dear adds an opening sequence that takes place a year before the investigation. The incident is based on conversations with Mrs Folliat and Merdell later in the novel. These opening sequences from the past that will later have an impact on the plot have become a norm on these productions over the years; a number of episodes have the same addition. Furthermore, the telephone call from Mrs Oliver in the opening chapter is removed, including Miss Lemon and the Whitehaven setting. Miss Lemon's absence makes sense, both because this episode isn't explicitly set after The Big Four, and because Poirot is in semi-retirement at this point of his career. George the valet could have made an appearance, but they probably decided not to include him because of availability issues or costs. Instead, Poirot has received a telegram from Mrs Oliver and is on his way from the station when we first see him. Some characters are deleted in the subsequent sections, including the Mastertons (though Mrs Masterton becomes Warburton's wife, and Warburton becomes a Member of Parliament), Sergeant Cottrell (his lines are given to Hoskins instead), the Chief Constable, and Mrs and Mr Tucker (Marlene's parents). None of these deletions really impact the story, and they are probably all a result of time constraints rather than creative decisions. A subplot involving Alec Legge and a man in a turtle-patterned shirt is deleted (probably due to time constraints, or possibly the fact that it doesn't really add anything to the plot). The incident in the camellia garden with Mrs Oliver and Poirot is deleted, and so is the police re-enactment of the possible drowning of Hattie. Finally, the ending is changed. The setting from the denouement is changed from Folliat's lodge to the boathouse (they seem to have avoided the lodge throughout - I wonder if the location was unavailable or didn't suit the period setting?). Also, in the novel, the fate of the Mrs Folliat and her son is left open ('Will you leave me alone now? There are some things that one has to face quite alone...'). Here, Mrs Folliat asks Poirot to allow her to meet her son before she is arrested. He allows it, 'as a courtesy from an old gentleman'. She goes to James's study and tells him to do exactly what she tells him to do, for once in his life. Outside, two shots are heard, and they presumably commit a murder-suicide. Poirot seems to approve of this with the final word of the episode: 'Bon'. The new ending is intriguing. It gives the Folliats a more explicit fate, but we are not told who killed whom (reminiscent of Elephants Can Remember). Also, it's interesting to view Poirot's changed sense of justice since his encounter with the culprits in Murder on the Orient Express. The decision he had to make there has obviously affected his sense of justice (although he has 'allowed' suicides before - Peril at End House, The Hollow etc). All in all, Dear has done an excellent job. The script is very faithful to its source material. He must know Christie pretty much inside out by now, having adapted a total of six episodes. That doesn't come close to Clive Exton, but his adaptations have generally done justice to the novels they were based on (possibly apart from the ending of Cards on the Table). Tom Vaughan's direction really suits the atmosphere of the story and the location. He utilises the garden, the boathouse, and the woods to their utmost potential. They almost become a character of their own, helped along by the crows in the trees (reminiscent of The Tragedy at Marsdon Manor). The garden fête scene feels slightly rushed, but it does convey the hustle and bustle of the event. The production team have done an excellent job with the fête and the particularly colourful costumes in this episode. The main location used was Greenway, Agatha Christie's holiday home. It's a beautiful setting, and it really affects the way the story progresses. The house becomes a character of its own. Christian Henson's soundtrack works well for the episode (notice the minute hints to the theme tune every now and then). Some might find the muted brass instruments a bit too much, but I think they work for the atmosphere the adaptation is trying to create. Poirot is generally quite displeased with his skills this time around. That's partly based on the novel, but certain minute references are added to his 'grey cells' slowing down. Then there's his changing sense of justice, as evidenced in the end scene. It will be interesting to view this episode again when all 70 episodes have aired and consider the development of his sense of justice and morality. Of course, plenty of Poirot's eccentricities are added. He 'twirls his moustache to a ferocious couple of points' (the sentence, taken from the novel, was even a scene description in the script! ), he struggles with the countryside and walking around in the woods, and he takes an instant dislike to the students in shorts. Also, there's a particularly funny scene with a large Kewpie doll, taken straight from the novel. Apparently, the scene was not intended to be included in the script, but Suchet asked for its inclusion (which reminds me of the scene with the marrow he insisted on for The Murder of Roger Ackroyd). The interaction between Suchet and Wanamaker is as brilliant as ever. Ariadne's incoherent police interview reminded me of the peacock scene from Third Girl. The afternoon tea between them in London was a nice addition. I particularly enjoyed the fact that Poirot called Ariadne back to Nasse by a telegram, the exact same method and the exact same meeting place (the battery). It highlighted the sense of humour between them. I only wish they had included the tiny reference to Hastings in that scene (but that's a minor complaint). The final exchange between them, on their two favourite methods (deduction and intuition) was also a nice touch. Of the guest actors, Sinead Cusack stood out as Mrs Folliat. Sean Pertwee did a good job as Sir George, and several of the actors in minor roles suited their characters perfectly. The lack of an Italian accent (or small grammatical mistakes) in Stephanie Leonidas' Hattie was something of a plot hole. Similarly, Fransesca Zoutewelle's Dutch accent seemed a bit overdone, but then again the point of her character is to stand out as 'foreign', so perhaps it was necessary. 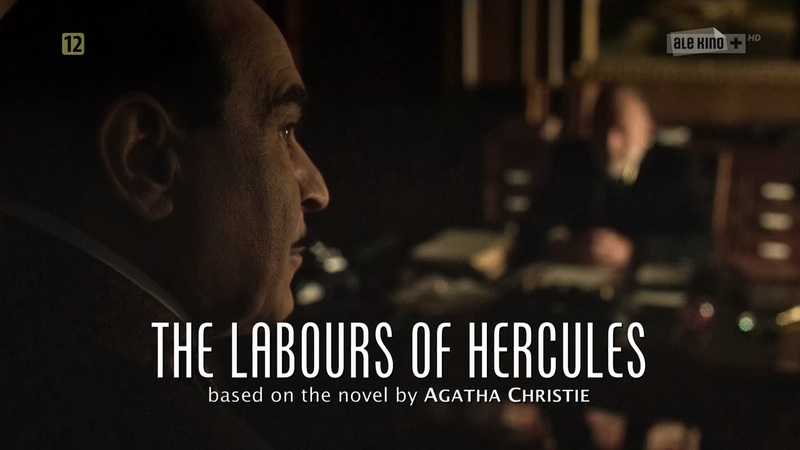 "ueetba", a Poirot fan from Poland, very kindly sent me these screenshots from the broadcast of The Labours of Hercules. SPOILERS if you don't want to see what the episode looks like. Click the 'read more' link to see all the screenshots.